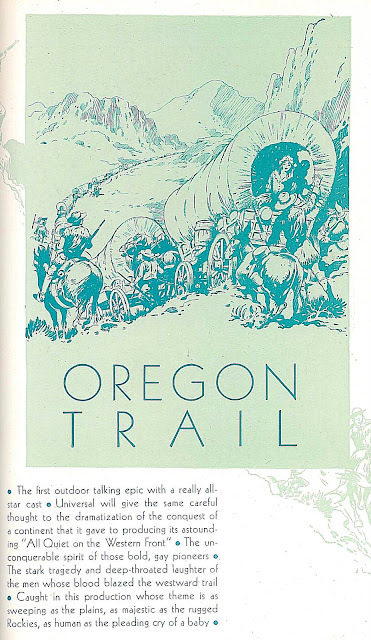 I think it's entirely possible people didn't know how to watch The Big Trail. When we see it we've seen that kind of big ensemble on screen with no one zeroed in on in closeup, Altman movies and the like, so we know how to decipher and pick out what we are supposed to pay attention to. But to people back then it must have felt like going back to films of the 00's, when the camera just captured everybody in longshot and didn't focus on anything in particular. That's an interesting theory. 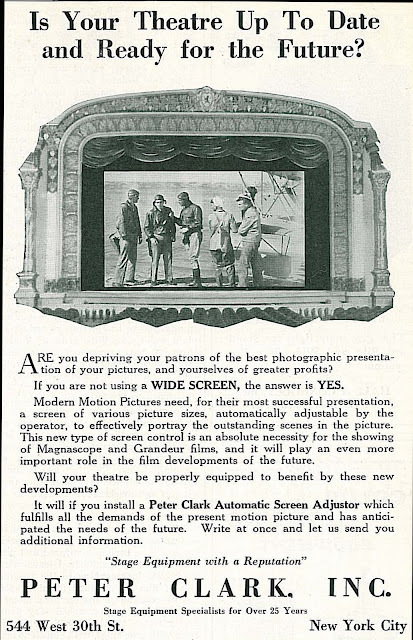 A wide screen in 1930 would have been at the least disorienting. Critical reaction I've read from the period was surely divided. 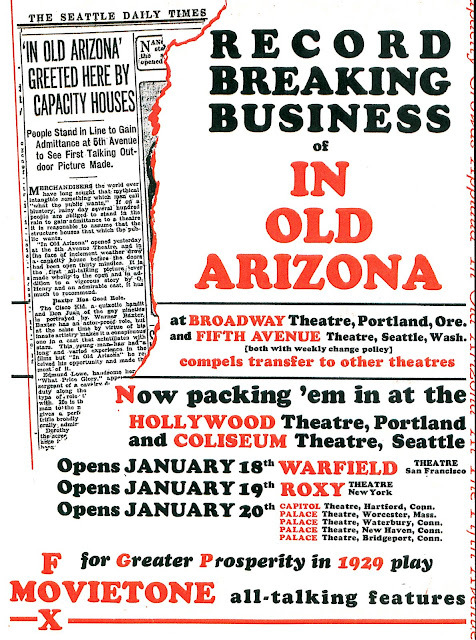 70mm might well have had an impact even greater than sound on those few who saw the real thing. What a leap after years of watching a virtually square image! I've always had minor issues because of somewhat poor vision when it comes to theater viewings, regardless of aspect ratio, and I find myself concentrating on only parts of the screen sometimes, with an occasional loss of some of the other elements of the film, then I wonder what the heck happened when that part becomes vital to understanding the film. I have to see two or three films in theaters in a reasonably close time frame before my vision catches up with my brain, and I see the whole screen. I don't do this when viewing real life outside, and certainly not when seeing large vistas - but when I watch a wide screen film in a theater, damned if I don't revert to the partial viewing again, and it's worse for while, but the good thing is I can usually see the big picture by halfway thru. I'm sure there might be a processing glitch for some people, and it seems to be an acquired trait to see it right for some people like me. If you aren't used to seeing a big screen, much less with hardly any close ups, I bet Michael's correct - your previous frame of reference can't catch up to the constantly wide 'look', perhaps not ever, altho I think it's a learned behavior through experience. There is information in your great post that was not considere; but that is because it is only available in Spanish. 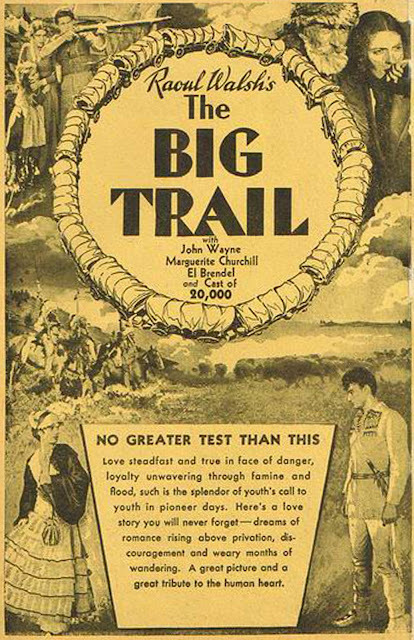 LA GRAN JORNADA, is the title for the Spanish language version as it was released in, at least, Argentina. 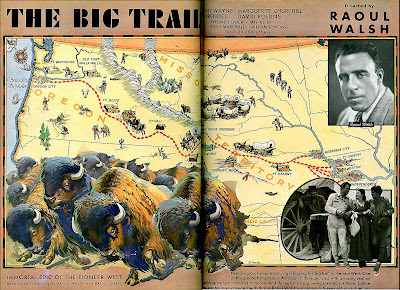 The film was extremely popular (it was in exhibition, for an entire year in main movie theaters) and there was praise for both directors David Howard and Raoul Walsh for their achievement. 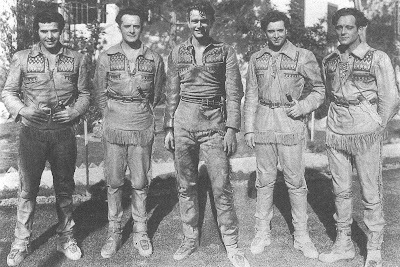 George Lewis (who is the first one at left in that photo of actors along John Wayne) also received good notices and went to star in a few films that the Fox Film Corporation produced in the Cervantes language in those years. 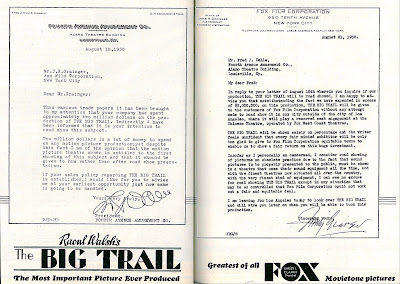 (And Fox continued making spanish language films up to 1935). For the release in Spain, the film was retitled HORIZONTES NUEVOS. 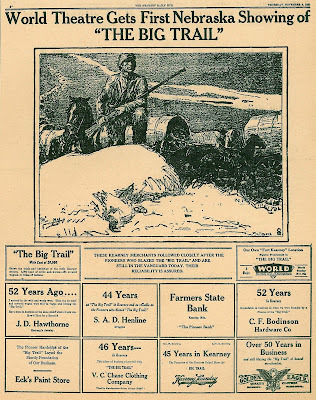 And following "Cita en Hollywood" by Juan B. Heinink and Bob Dickson, we can also learn that audiences in Spain, not Argentina, were able to see a seventh version... as a silent film! That silent version (lifted from the original production shot in Enligsh) was presented, in Madrid, as LA GRAN JORNADA on February 29, 1932. 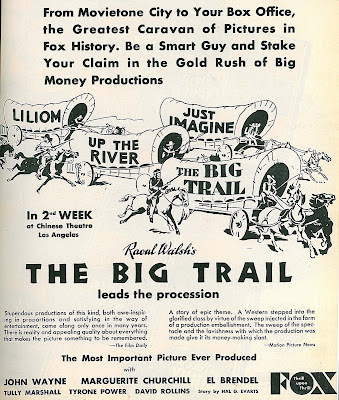 Your box office figures on Raoul Walsh's films just before The Big Trail go a long way to explain why John Ford was so furious at John Wayne for doing this film. 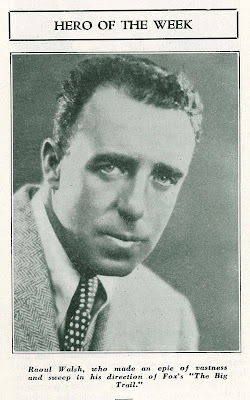 In contrast to their later reputations, Walsh then clearly stood higher than Ford in the Fox pecking order (Ford was almost certainly lower than Borzage as well), and Ford, who could detect slights where none was intended, surely felt that Wayne was leaving him for someone more successful. 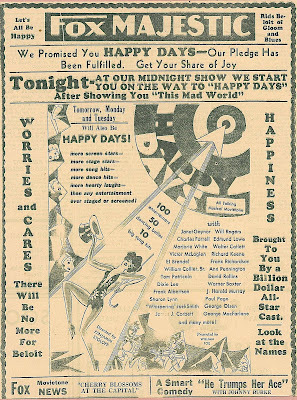 A continuing mystery, though, is why Fox would try to showcase Grandeur with Happy Days, which is essentially one long minstrel show. 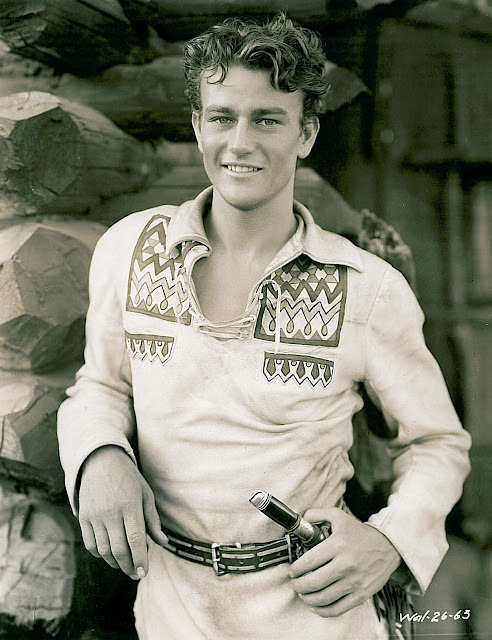 Finally, since Charles Farrell was as physically imposing as the John Wayne of 1930, and back then Wayne's voice was not much deeper than Farrell's notoriously light one, the thinking behind using an unknown and obviously unready Wayne, instead of taking advantage of Farrell's position as a top box office star, is worth looking into. And since Janet Gaynor was then rebelling at doing so many musicals for which she was ill-equipped, it would seem that putting her in the Marguerite Churchill role would not only guarantee a much better gross but would make the studio's top box office draw a happier employee.